The conversion between the realm of classical art and what is considered modern, in a sense triumphs those who oppose change. Dreams, inceptions, and reality play a definitive role in the metaphysical manifestation of Artwork. 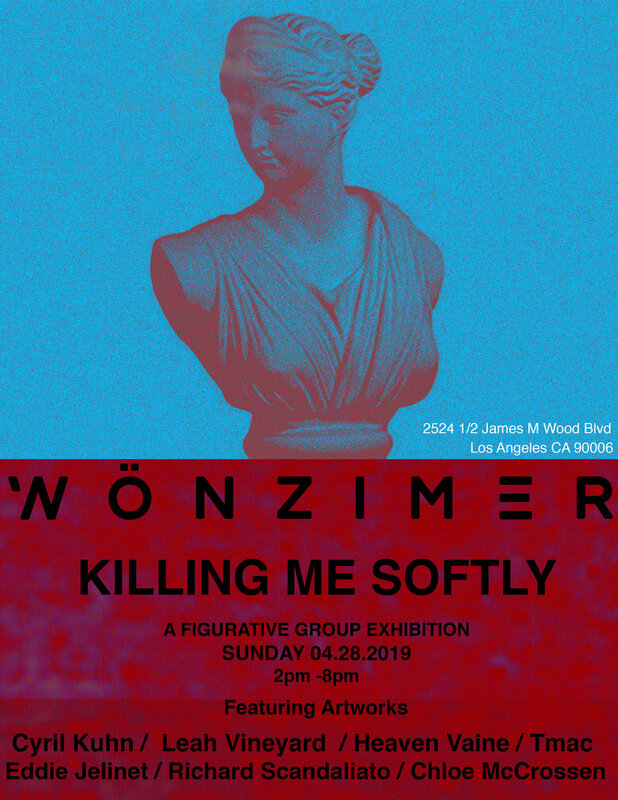 The exhibition ‘Killing Me Softly’ explores the conservative role modern figurative work plays in the 21st century, curating artwork that encompass traditional stylistic choices while displaying peculiar and abnormal content that has only become more familiar in modern history. Wonzimer attempts to find a narrative between diverse and global artists such as Cyril Kuhn from Zurich (Switzerland), Eddie Jelinet from Mexico, TMac a Los Angeles Local from the UK, Leah Vineyard from Arizona, Chloe McCrossen and Heaven Vaine from Long Beach and Richard Scandaliato from Los Angeles. The artists will showcase figurative art work which evoke a reconsideration of what is possible in the art form of painting with the nearly limitless fountain of information and inspiration that modern technology allows us. The title ‘Killing Me Softly’ captures the transformation of our associations through time! The variety of interchanging complex emotions we feel from a piece of art can drastically change when examining the context of where we currently stand in history.